Peroni was desperate, he saw his European ambitions vanish before his eyes… but thanks to Ova Dunn’s incompetence he had another chance. The Australian had done an unremarkable job as the GL President and calls for a new President began to be heard around the league. Peroni won the elections swiftly, despite a good push by Faria and Farroni. Peroni had a chance to rebuild his fortune. 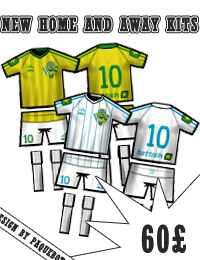 Through a shell company, the Uruguayan bought one of the Golden League main sponsors: Nuke. His plan was simple, he renewed the sponsorship contract at astronomical fees and planned on filling his pockets by draining the coffers of the GL Council. He was so confident on the success of his evil doings, that he ended up making a mistake. With Lord Bebbington looking into buying clubs in different parts of the world, Peroni saw a leadership void in Rasków and left the GL Presidency to fill it. He thought he could leave the GL at the hands of one of his pawns, but he wasn’t counting on Farroni. The Italian had his own ambitions and saw Peroni’s resignation as an invitation to take his seat, which he promptly did. Sophía Peroni also saw an opportunity and intervened. She established a competing brand to Aldopaolo’s Nuke, the BS Brand, and convinced Farroni to ditch the old sponsor for a newer, better brand. And just like that Peroni was ruined. He had invested everything he had left of his wealth into Nuke and he wasn’t going to see any return. He confronted Sophía, to ask her why she was helping Farroni and not him, and she finally told him, how she knew he had killed her father all those years ago. But that wasn’t all, she threatened to expose him to the police if he didn’t disappear for good. Peroni took a leave of absence from his post with the Wodkas and launched his final attack. Through Alin Badiu he ran a piece calling for Farroni’s head, but the lack of support shown by other clubs was enough to show the world that the old king is dead. What will Peroni do now? Only time will tell, but for now he’s a ruined man, without his fortune and without his influence. There are new players in the game, ones that will not repeat his mistakes. Don’t be surprised to see him behind bars in the near future or to never hear from him again. As the loud sound of a gunshot echoed through the streets of Motevideo the lives of the members of the Peroni family were about to change forever. Then the coach of a failing Wodkas team, Aldopaolo Peroni lost his brother, but gained control over an empire. Then a 3-year-old Sophia Peroni lost her father, but gained a purpose. Nicholás Peroni, like his brother Al, grew up in a poorer zone of the Uruguayan capital, dreaming of becoming a football player, but a torn ACL when he was 15 ended his dreams and set him on a different path. While his brother went on to become a rather mediocre player and later coach, Nicholás became a very successful businessman in the cattle raising trade. Said to be a ruthless man, he rose to fortune by buying land from his competitors at cheap price and expanding his domains. Perhaps because of that came the rumors that Nicholás wasn’t living off only of cattle, but also of the illegal drug trade within South America. Nobody could ever prove the older Peroni was connected to illicit behaviour, – everyone that tried was either found dead or mysteriously disappeared – and as such life went on. Until, the fatidical night. Young Sophia would await eagerly for her father to return every night. She had lost her mother at birth and as such her father was the only family she knew – uncle Al was always away in some crazy place. But that night dad didn’t return home. Nicholás Peroni was shot dead in his car while returning home in his car. The killer was never found, but romours circled around the city that it had been a rival faction, trying to take over the drug trade. Aldopaolo became Sophia’s guardian and as such was entrusted as the new kingpin in the family business. At that point the Wodkas had filled for bankrupcy and Al flew back to Uruguay, to start a new life. He sent Sophia away, to a boarding school in England and over the next few months would begin to wage war against the men who killed his brother. In the 6 months following Nicholás’ death the Uruguayan police registered the murder of hundreds of drug traffickers. All of them were said oppositors of the Peroni family. Aldopaolo realized he was good at his new trade. He grew his empire beyond everything his brother had ever dreamed. And decided it was time for expansion. Aldopaolo contacted the eccentric millionaire known as Lord Bebbington and pleaded to him to re-open the now deceased Flaming Wodkas FC as Renaissance FC with him in charge. Known for his love for Polish vodka, Bebbington was quickly convinced by his former coach over a few drinks and registered the new club. Peroni thought that a football club was a great front for his drug trade and thanks to the owner’s crazy aptidude for selling and buying new players every season, he could set up a money laundering scheme within the club. 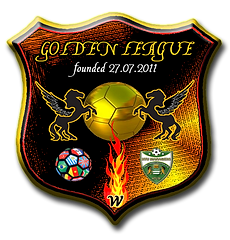 He wasn’t counting however with the growth of the Golden League into a worldwide competition, that would bring the club from Raszków to the spotlight. And so, he had to take a step back in his ambitions, and for the next few years he acted as the club president, taking some time off every now and then to run his other ventures. Meanwhile, in England Sophía grew into a woman. Everything she did, she did with excellence. She was a brilliant young woman, but something bothered her. She could never let her father’s murder go. She needed to know what happened to him. Eventualy, she met a man she could trust. Then the coach of The Londoner Tricolor, Terry Leask was a charming man and Sophía fell in love with him. She trusted him, so she presented him her teory. Uncle Al had killed father to take over the family business. She hated him and she wanted to bring him down. So, together they came up with a plan. They faked her kidnapping and ended up stealing a large chunk of Aldopaolo’s fortune without his knowledge. Former Mejores’ coach Christian Farroni has called for a press conference at the GL Headquarters in Odense. He’s expected to announce his confirmation as the new GL President and to adress the Rochdale-Saxons feud among other situations. We’ll be providing live coverage as events unfold. Good evening ladies and gentlemen. As you may recall, a few months ago Mr. Peroni resigned the GL presidency to go back to Poland. When he left, decisions were left unmade and someone needed to step up and fill up his place. As an experienced businessman, I decided that I was the most capable man for the job and have been doing it ever since. However, some people thought I didn’t have the right to do a job I wasn’t elected for. Well, the reason I’ve called this press conference is to announce that following a closed election, held last week, with the members of the GL Council, I’ve been elected the new GL President. It was an unanimous decision and I’m very much looking forward to what comes next. I’ll be answering some questions now. The first question comes from experienced reporter Piepaolo Scavo: Mr. Farroni, there’s been clamour from The Lost Saxons part for a GL intervention following Mr Mayhem’s comments regarding their rivalry. What’s your stance on the case? I’m glad you asked. As it is, I can assure you that we’ve looked into Mayhem’s accusations and found no wrongdoing from the Saxons part. However, we have received an anonymous tip that Rochdale has put up a bounty for whoever injuries Saxons’ star Martin Frain and that is not something we will tolerate. We’ll be taking a further look into it, but I can announce that we’ll be suspending Mr. Nélson Faria from any GL related position for the near future. Tommy Linden, Rochdale United Press: Mr Farroni, your entry into the presidential hotseat is rumoured to be dodgy and underhanded, especially considering you came dead last in a three horse race in the last election. What would you like to say to all those that doubt your integrity, and your ‘right’ to hold such a position? You want to talk about an election, talk about these results: no member of the council voted against me. Now, you may say I wasn’t elected by the people, like Peroni, but the popular vote is overrated. I was elected by the finest and most involved people in the GL, the ones that know what needs to be done, the ones that know I’m the one to move the GL forward. Efraín Sepúlveda, GL-TV Brasil: Following up on my colleagues question: Some people were surprised by the abscence of representatives of FC Rünenberg and Clan Phoenix, who were among your most vocal opposition, in the vote. Some even suggest that you have a hand on their sudden disappearance. Don’t you think it’s an odd situation? When you’re in a position like mine you have to accept not everyone will be happy with you. But as I have only the GL’s best interest at hearth, I sat down with them and to solve our differences I sent them to a night with the fishes. Unfortunately, they haven’t returned so far. The next question comes from a Polish reporter: Mr. Farroni, let me first congratulate you on your succession to the Presidency of the Golden League, in this prestigious tenth season. I know many people will be pleased to see strong leadership at the helm of the GL ship, and that it is in safe hands. Already, you have shown that you will not stand for any sort of underhand business and we can’t quite believe that Mr. Mayhem is here on your blog casting doubts and shadows against your name. However, back to topic – our question for you, would be to ask if you have any burning issues that need resolving regarding the Golden League e.g. existing format, sponsorship, awards, HTU Masters etc? Thank you, it’s great to see not everyone here is a pawn for the opposition. We have big projects in mind for the tenth aniversary. I’m happy to announce that I’ll be indeed launching the Golden B, GL’s official beer. We’ve also signed a new multi-million sponsorship deal with Sophia Peroni’s Big Star Brand to provide us with official match balls and licensed merchandising. 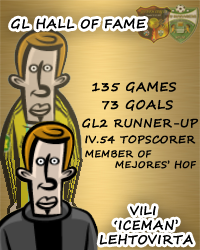 We’re working on bringing back the GL MVP award and possibly adding new awards for the future. As to the format, we’re currently satisfied with what we’ve got, but we’re open to any ideas and we’ll be consulting the public soon. Efraín Sepúlveda requests to talk again. I’m sorry, but going back to my last question: Did you say you your opponents are sleeping with the fishes? Isn’t that the way the mafia talks about the people they’ve killed? I’m not sure what you’re trying to insinuate here. Are you saying I’m a mafioso just because I’m italian? That’s offensive, you know? Efraín again: Not at all, Mr. Farroni. I’m just saying, there are rumors flying around about your business practicess. Rumors that make Al Peroni look like a mere high school bully. I think what I’m trying to say is that the public wants some clarity regarding your practices.